As someone who’s been living on Koh Tao for three months without a motorcycle or scooter, I know a thing or two about life on the island sans wheels. Renting a bike or scooter is an excellent way to get around in Asia — but only if you’re an excellent and confident driver! I’ve seen far, far too many people get in accidents or get ripped off for returning their bike to the rental people with a new scratch or two to recommend renting a scooter on the island. Plus, it’s an extremely hilly island – like way more than other places in Thailand. People are falling off their bikes and getting injured all the time here. 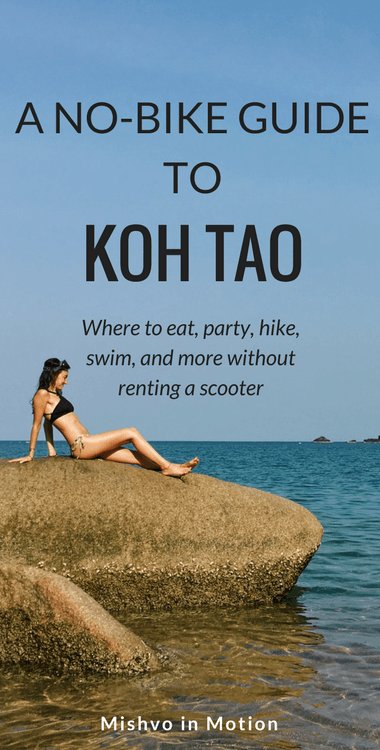 So yeah I thought I would write up a walking only guide to Koh Tao for those of you who plan to skip the motorbike. This will be extra useful if you’re staying in Sairee (which I recommend if you’re going bike-less) as that’s where I live! This post may include affiliate links which means if you buy something through the link, I get a very small commission. I only recommend products and services I have used/done myself and love and think you’ll love too! This hostel is about the same distance from town as the Hive but deeper in the forest (and yes this does mean there are a lot of mosquitoes here). I think this might be the cheapest hostel you’ll find in Sairee. I’ve heard good things. This one is a tiny bit further up the street but it’s still very easy to walk around the island from here. I’ve heard great things about this hostel. It always looks bustling with people. Another hostel in Sairee. They are bigger and have a restaurant and dive shop attached so it’s a bit more expensive to stay here. If you’re traveling in a couple or group or just looking for some privacy, you can book one of these bungalows right near the water. Another bungalow place right by the beach. $ 995 Roasted Duck – This is one of my favorite restaurants on the island and bonus it’s also super affordable! 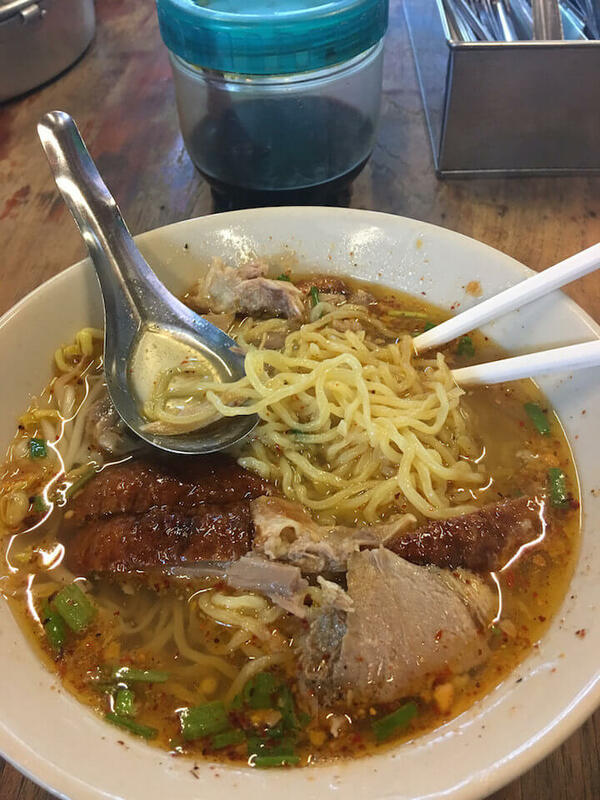 I recommend the spicy roasted duck soup with egg noodle (#7). Prices are as low as 70THB. They also have chicken and pork options e.g. chicken fried rice if you’re not into duck, although the duck is their specialty. $$ Cantina de Koh Tao – This is my go-to spot for Mexican food when I have a craving. They have veggie and vegan options. They are located in a ‘fusion’ place alongside two other restaurants – one Chinese and the other basic western food – that are also both really delicious. You can order from all three menus at the same place which is fun. 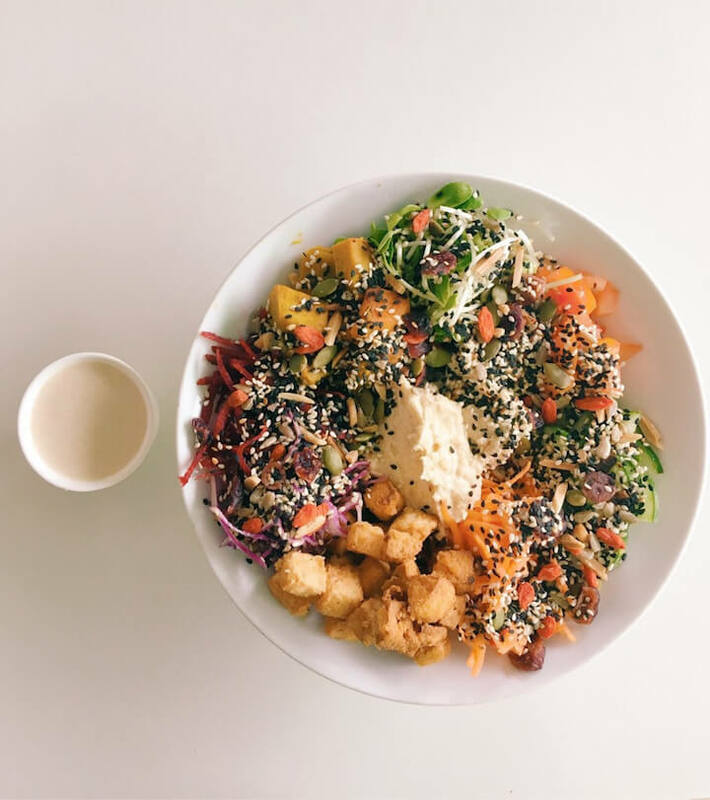 $$ Vegetabowl – They have healthy/vegan/veggie options like Buddha bowls with all fresh ingredients. I recommend trying the vegan cookies if they have them. $$ Fitness Café – This is another spot with good healthy and protein-packed options. They also have the best breakfast deal I’ve seen on the island (not a health food thing): 100THB for 2 eggs, 2 toast, bacon, beans, and coffee or tea but ya gotta get there between 8:30 – 11:30 am. $ Zest Café – Zest also has great breakfast options. Plus the woman who works here is so friendly and sweet. You can get two eggs and toast for 60THB here. $ ‘Big 7-Eleven’ night market – Only dinner. Check out this spot in the evenings for some more traditional Thai street food starting at around 70THB. Try the chicken noodle soup (guay tiaow gai) from the soup lady in front of the 7-Eleven. $$ Sairee Cottage Diving Restaurant – Sairee Cottage has my favorite pizza I’ve tried here. It’s always buzzing with people which makes sense as the pizza is yum and the view is right on the beach. I believe they also do the beach sunset kabob barbecue thing if you’re into that. $$ Uschi’s Taste of Home – I mean listen, this place has 5 stars and over 500 reviews on TripAdvisor. It’s just delicious. It’s German food mainly and I can vouch for the famous schnitzel: it’s super yummy. $$$ Thaita Italian Restaurant – If you’re looking for a special occasion or #treatyourself moment, I recommend this really charming candlelit Italian restaurant. They’re only open for dinner and I recommend making a reservation ahead of time. The food is fresh and delicious. Sairee is the island’s main and longest stretch of beach. It’s lined with restaurants and bars and has a lot of longtail boats (boat taxis) and SCUBA boats docked there. It’s good for a quick beach fix and for watching the sunset (it faces west), but not good for swimming or snorkeling or beauty if you’re looking for that. I only just discovered this beach but it has quickly become one of my favorites on the island. It’s small and secluded, surrounded by rocks and has just one restaurant/bar. The water is deep enough for good swimming and there’s a lot to see in terms of snorkeling. Try going to the rocks to the right of the beach for snorkeling. To get here from the 7-Eleven in Sairee, walk up the road away from Sairee beach towards Smile Mart/the Gym. You’ll pass a sign for Mango Viewpoint on your left. Keep going straight and down the hill until you hit the beach. It’s a hilly hike and you’ll be nice and sweaty by the time you arrive. 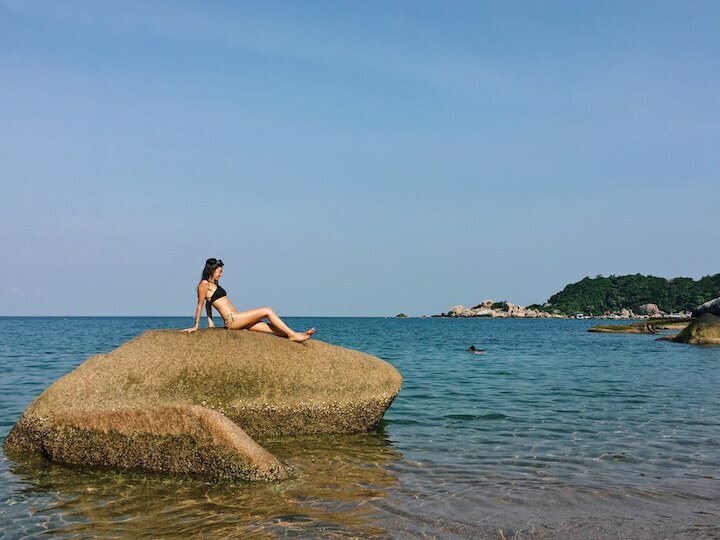 Laem Thian is a very secluded small beach at an abandoned hostel. 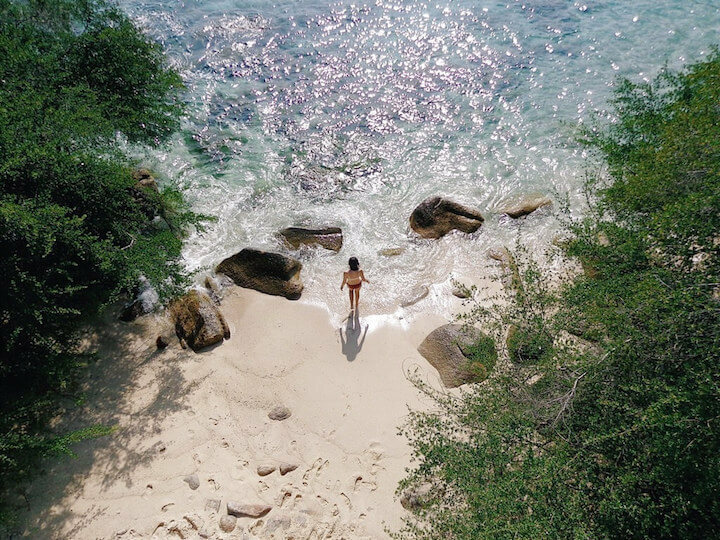 It’s good for snorkeling and cliff jumping (but be careful!). The size of the small little beach there will depend on if the tide is high or low. I recommend bringing well enough food and water because there are no restaurants nearby. Sai Nuan is a small, secluded beach south of Mae Haad (the pier). 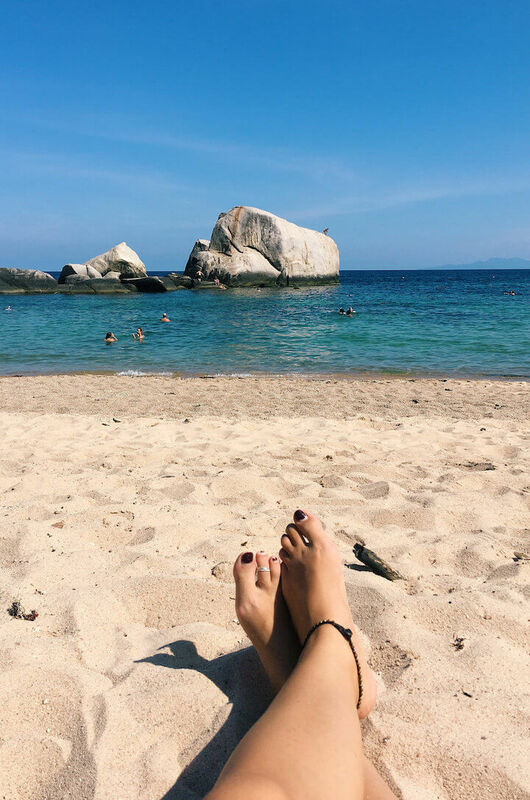 I love this beach – I find it so picturesque and it’s good for swimming and snorkeling. There are a few restaurants nearby but you still get the secluded vibes. Even though the walk here is quite long, it’s mostly flat and it’s along the coast so can be very beautiful at points. To get here from Sairee, take the walking street south towards Mae Haad (the pier) and walk past the pier. Then follow signs to Sai Nuan. You can also take a longtail boat here from Sairee. These are the small islands off the northwest coast of Koh Tao connected by a strip of sand. 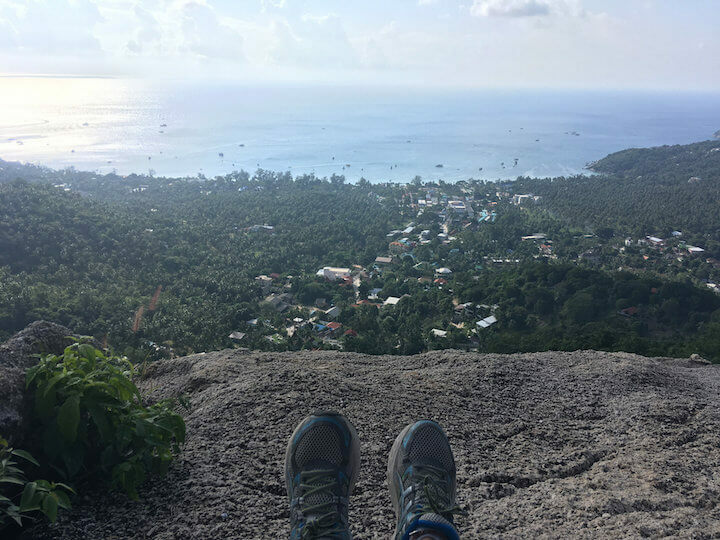 The viewpoint from the top of one of the islands is the Koh Tao postcard shot on everyone’s Instagram (see below under ‘Hiking’). Anyways, as far as a beach goes, this one can be very busy and isn’t that big to begin with – especially at high tide – so you might be fighting for a spot in the sand. There’s only one restaurant here and it can be quite expensive so I recommend bringing all the water and snacks you’ll want for the day. All that said, the viewpoint is pretty stunning. To get here, you’ll need to hire boat taxi from Sairee beach. It should be between 100-250THB per person return. Also, it’s 100THB to enter the island as it’s privately owned, and it closes at 5! 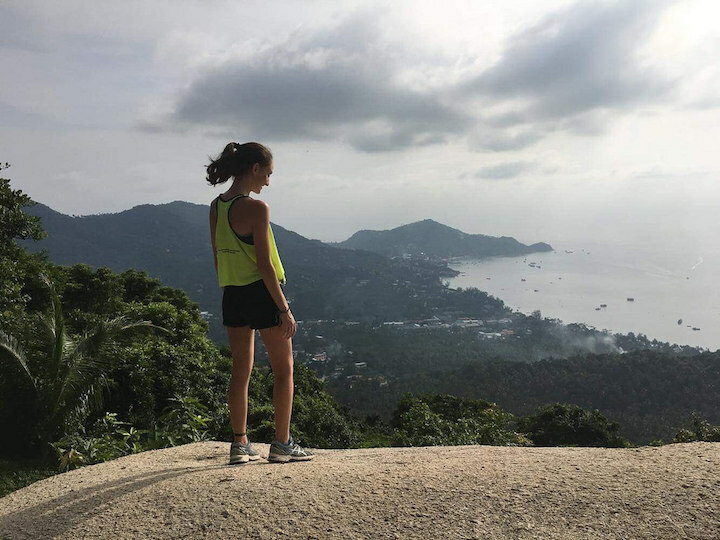 Koh Tao is incredibly hilly and the hikes here will have you dripping sweat and gulping for air – but the viewpoints are breathtaking and totally worth it. I recommend wearing good shoes (e.g. sneakers or comfortable sandals with an ankle strap) for any hiking on the island. Even going barefoot is better than trying to climb a nearly vertical hill in flip-flops. For you intrepid [/lazy] backpackers out there, I don’t recommend trying any of these on a motorbike. I’ve seen and heard of too many accidents on steep hills with blind spots to think this is worth it at all. This is a popular viewpoint and is great for sunset. There’s a restaurant at the top where you can chill and paint your name onto the wood if you want. If I remember correctly, it’s 50THB to enter the viewpoint. From the 7-Eleven in Sairee, walk up the road away from Sairee beach towards the gym and Tarna Align Resort. You’ll walk up a big hill after you pass the Tarna Align. You’ll see a sign for Mango Viewpoint on the left. For more details on hiking to Mango Viewpoint, check out this Alex in Wanderland post. 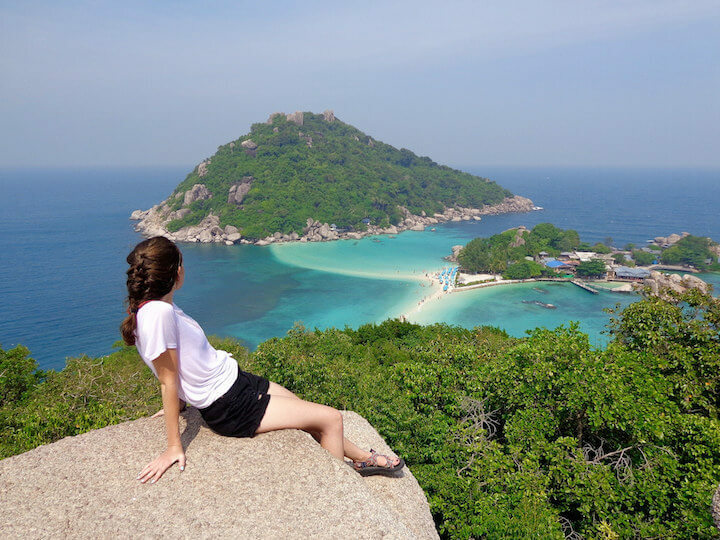 This is my favorite trek on Koh Tao so far. It’s a pretty jungly hike and feels more naturey and remote than the hike to Mango Viewpoint. Plus you get TWO viewpoints on this hike: the first over Hin Wong Bay and Sairee and the second facing west over Sairee (pictured below). Since it does face west, this is a good choice for sunset – just give yourself enough time to get back down before dark because there are no lights. To get here, again walk up the road towards the gym and Smile Mart, pass the Tarna Align Resort. Keep going up the hill until you see Mango Viewpoint sign on the left. A few meters farther on the right is the unmarked trail up to Fraggle. Check out the detailed directions from this post so you don’t get lost as there are almost no signs. See the beach section above for more info on Nang Yuan. Honestly, the viewpoint is one of the main reasons to go to the islands in the first place. You’ll see a sign for the viewpoint as you walk along the dock when you enter the island and it’s about a 20-minute hike up. I’ve seen it extremely busy at times where you have to wait in line to take your photo so I recommend doing the viewpoint first when you arrive to the islands then try again later before you leave if the line was too long for your liking the first time. This is where the party is at basically every single night. 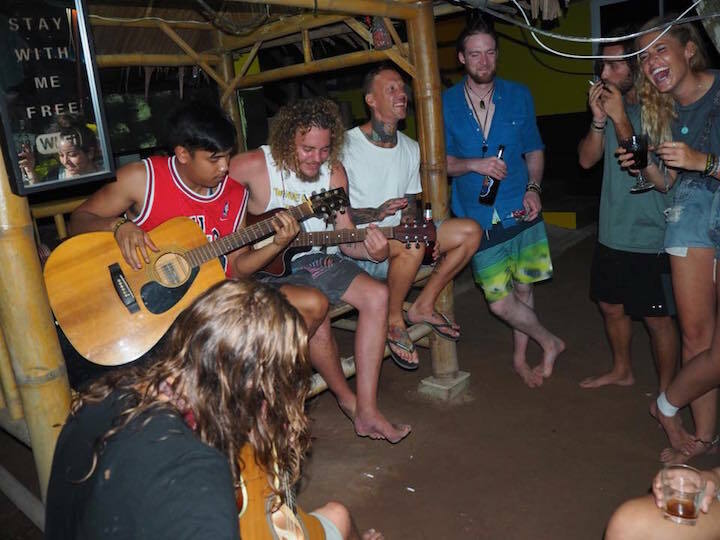 It’s the most popular bar on Koh Tao. Fishbowl is a restaurant during the day then they transition to live music then a nighttime bar/club scene. They are the final stop on the Pub Crawl and are also known for their multitude of beer pong tables. Fishbowl is located right on the beach, about 15 minutes walk south on the walking street from Sairee. This is next to Fishbowl. The scene here and at Leo Bar which is the next bar down are pretty similar to Fishbowl honestly, although of the three Leo is the one most likely to stay open late (like past 1 am). Friday nights are Latin Night at BND with Reggaeton music. Check out their rooftop bar if it’s open. 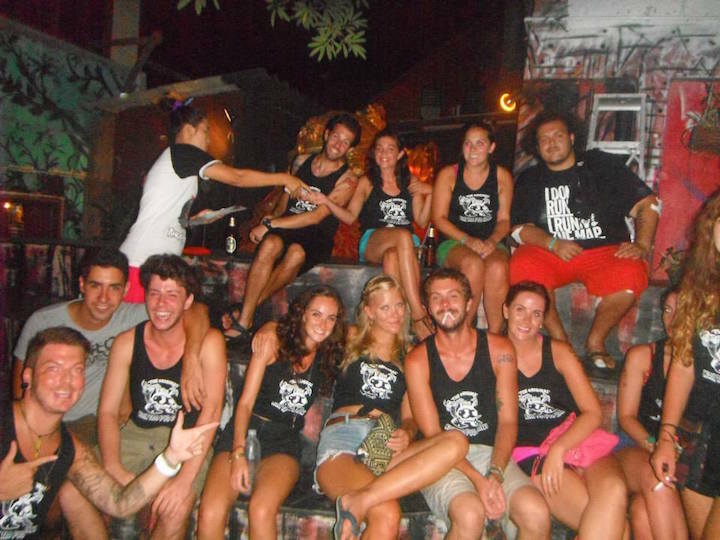 The Koh Tao Pub Crawl is a fun boozy party if you’re looking to meet people. It’s 450THB including a shirt, a bucket, entrance to the Cabaret show (Ladyboy show), and shots throughout the night. It starts at Chopper’s on the main street in Sairee at 7:30 pm on Mondays, Wednesdays, Fridays, and Sundays (I think – check their Facebook page for info). FIZZ beachlounge – If you’re looking for more of a chill drinking scene, check out this place right on Sairee beach. They have bean bags you can relax into, mood lighting, and chillstep to set the vibe. I mean if you’ve come to Koh Tao, chances are you’ve at LEAST thought about going diving. 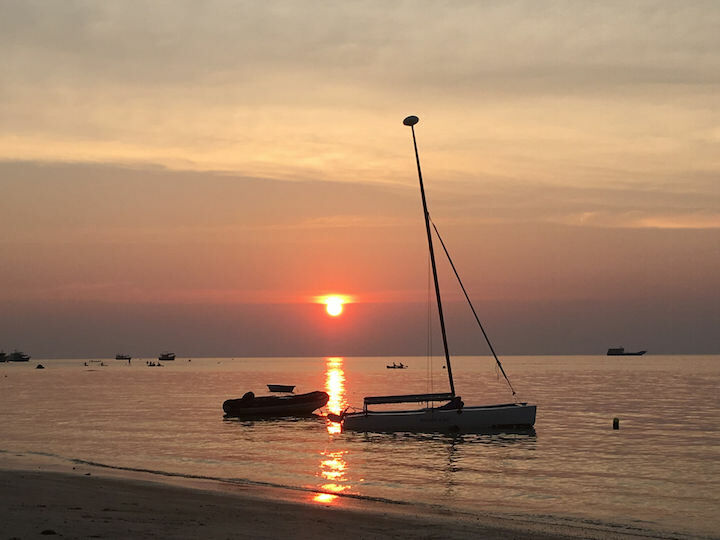 This is what Koh Tao is known for. If you’ve never dived before, you have the option to do a highly-supervised fun dive (I suspect it costs around 3,000 baht) or go get your Open Water certification for 8,000-9,000THB. The latter will take three days at least so you’ll need to have the time to stick around and do the course. In terms of which dive school to go with…The main thing you’ll need to decide is if you want the big dive school vibe or small. The former will feel airtight in terms of safety and regulations while the latter will allow you more one-on-one time with instructors and a more tight-knit feel with your classmates. I recommend Mojo Divers. I’ve been on fun dives with them and did my advanced SSI course as well. Ask for Instructor James and say I sent you! I’ve seen a lot of people come through Koh Tao and sign up for half- or full-day snorkel trips around the island. For like 600 baht, a longtail boat takes you to different beaches and snorkel spots around the island + lunch and probably gear. I’ve never been on one of these trips but could be a fun thing to do with friends or a good way to meet people. You can rent a standup paddleboard or kayak from a few different spots along Sairee beach if you want. I’ve seen prices at around 200-250THB/hour. Check out SUP TAO for paddleboard info. There are a few Muay Thai gyms on Koh Tao. Island Muay Thai is the closest one to Sairee. I do yoga at Shambhala in Sairee. They offer Hatha yoga classes twice a day: at 10 am and 6 pm, except Sunday evenings. Monday and Thursdays evening classes are restorative yoga. To get to Shambhala from the main 7-Eleven in Sairee, go to the right of the 7-Eleven (if you’re facing it) and you’ll see signs for Shambhala a few meters down on your left. Drop in classes cost 300THB but they also have packages you can buy for lower per-class prices. 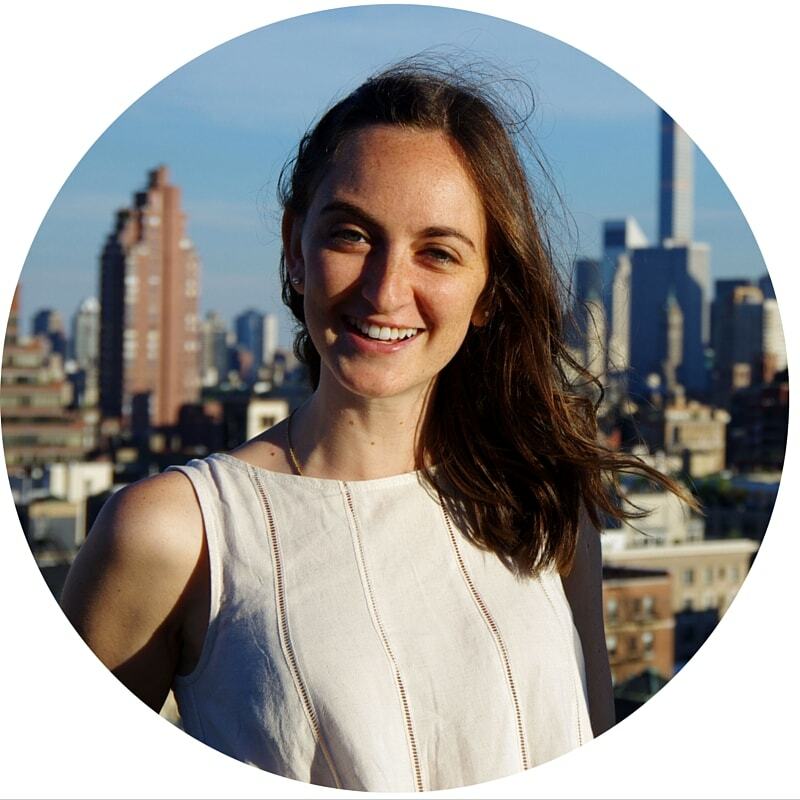 You can also check out Grounded for yoga, although they don’t have a standalone building. Instead, they do yoga on the beach in the morning and on the rooftop of a hostel in the evening. Check on the Grounded Facebook page for times and meeting places. 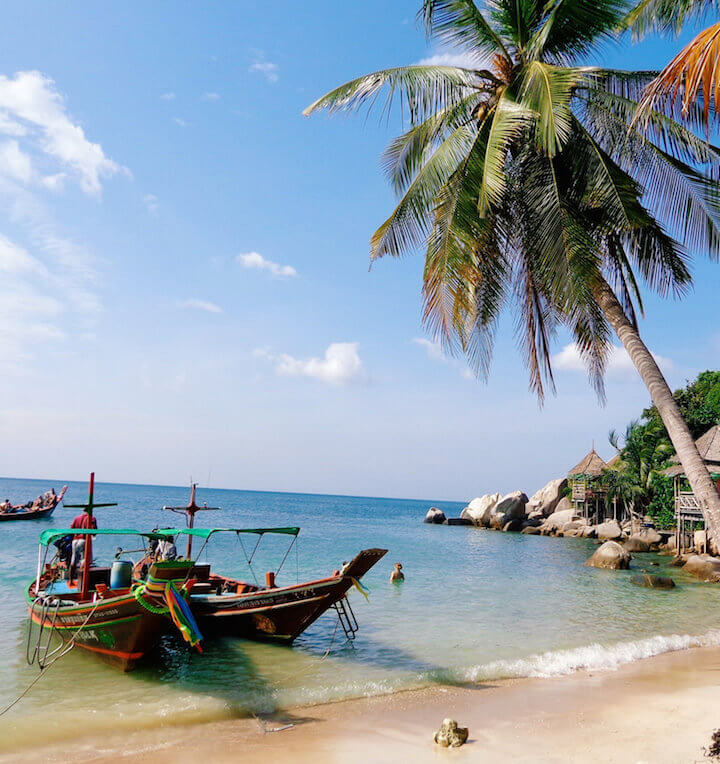 Tanote Beach is one of Koh Tao’s bigger and more popular beaches. It’s good for swimming and snorkeling, and there’s a big rock just off the coast you can swim to and jump off of. There are lots of restaurants nearby. A fairly big restaurant serving up really yummy and cheap Thai and Western dishes. Their portion sizes are enormous and prices are as low as the 70THB range. 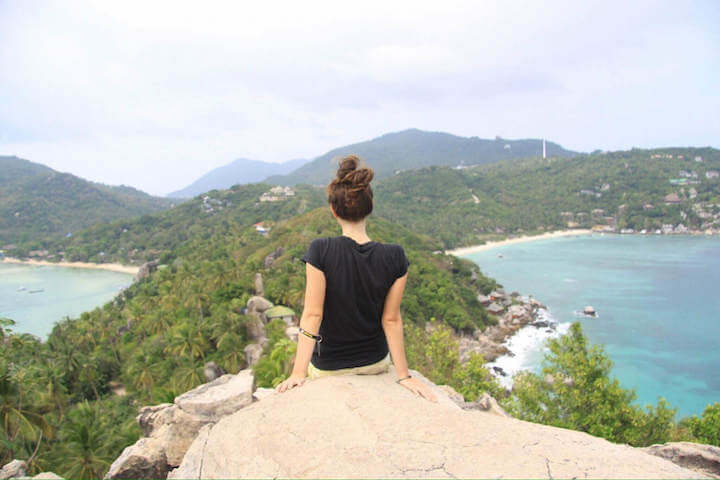 This is another Insta-famous viewpoint on Koh Tao. It’s the one where you can see both sides of the island/sea at once (reminiscent of the viewpoint on Koh Phi Phi in my opinion). You’ll have to pay 50 baht to enter Freedom Beach and another 50 baht to climb to the viewpoint. You can go to Freedom Beach afterward to cool off after the short hike but I’ve never felt like that beach is anything special. Well, what’d I miss?? Let me know if there’s anything I should go explore on the island next! I’ve been to Koh Tao twice, many years ago. Loved it. This article brought back memories. I got to stay on Koh Tao for three months taking out divers for a dive resort. I didn’t get paid but I did over 200 dives and really notched up my experience. It was awesome meeting all the tourists and learning about the operation of a scuba resort. All you need is to pay for your food and accommodation, which is damn cheap. 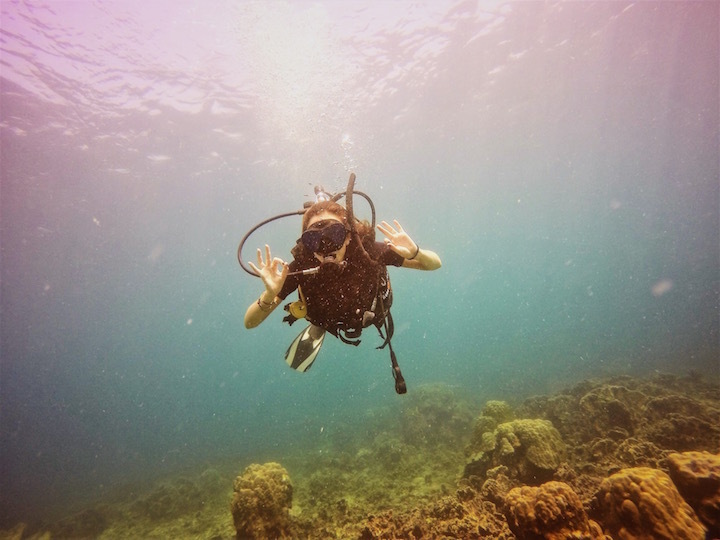 To follow up the divemaster you could become an instructor and live the dream teaching scuba on remote exotic islands. Hey Brian! Ah I’m glad it brought back some good memories for you. Yeah a lot of people stick around on Koh Tao to do their divemaster training and/or instructor training. It’s a great idea. And there’s a whole community of divers on the island to befriend if you stay awhile.